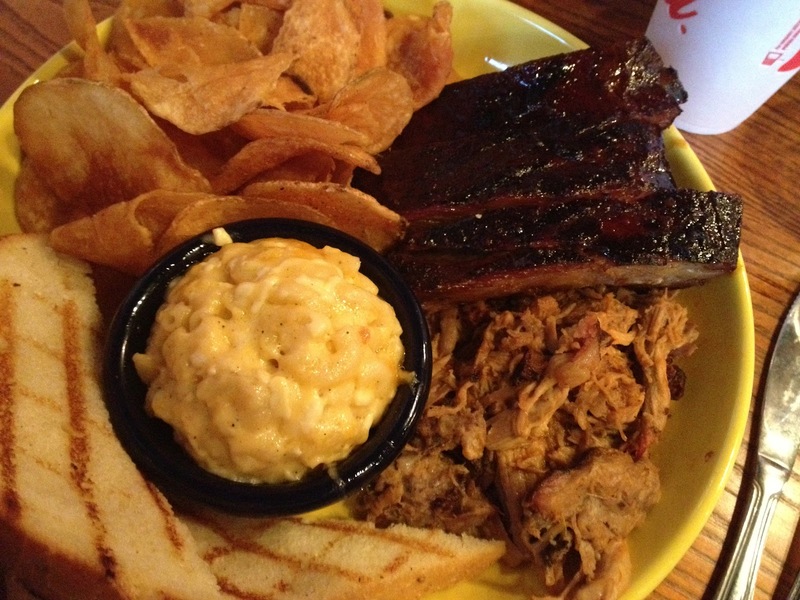 BBQ and bowling makes for a fun evening and in Charlotte you can do just that. 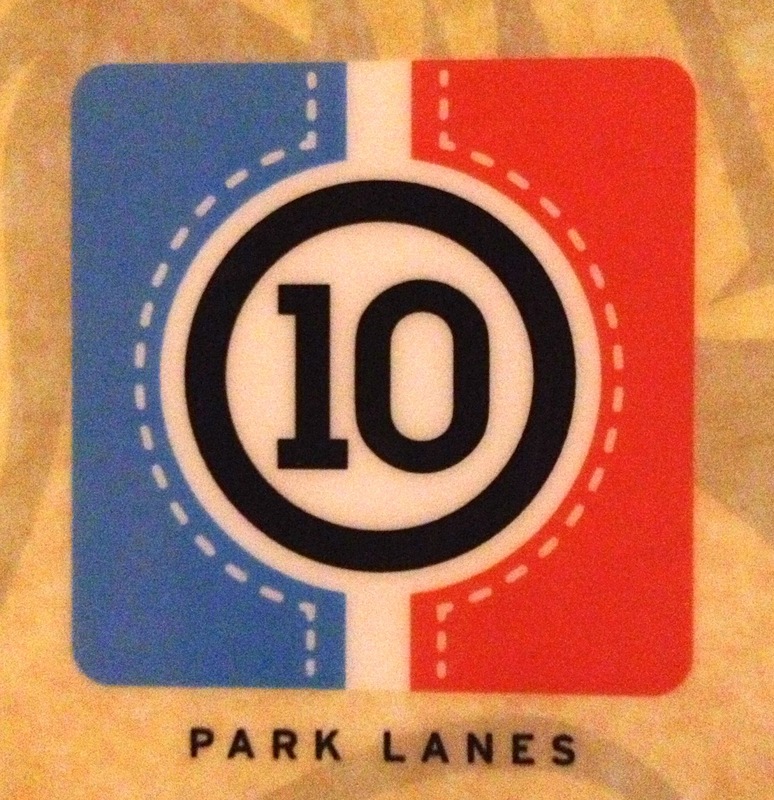 10 Park Lanes is a full bowling alley with a restaurant and bar. They are smoking up the Q and serving up wings, burgers, BBQ and fun. The building has a cool retro 50's feel to it but inside is up to date. There are two bars, an eating area, outside seating and a number of bowling lanes. On a Saturday night it gets busy and loud. We started dinner with wings. 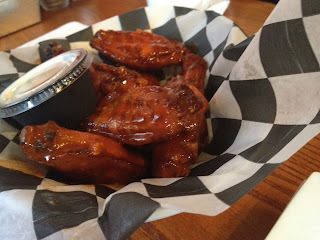 We tried their hot wings and this apricot chipotle BBQ wings. With the first bite I knew they smoked their wings. They are good. 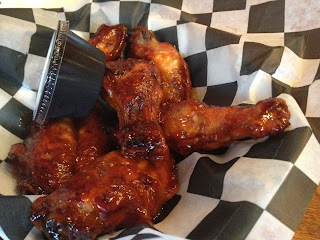 The hot wings aren't too hot but have a nice burn that heats up the back of the throat and your lips. If you're not a fan of spicy they might be too much for you. The BBQ wings were great. The chipotle brought a nice sweet smokiness to the flavor with the apricot giving it fruity hints which mellowed out the spiciness. The family really liked these. I ordered the two meat BBQ plate with pulled pork, ribs and homemade chips. It was good. The portion size was huge and I couldn't finish all the pulled pork. 10 Park Lanes uses apple, hickory and pecan wood to smoke their meats. It gives it a nice mellow smoke flavor that really accentuates the meat. They make a solid BBQ. The ribs were St. Louis cut wet ribs. The sauce they use complements the meat well and tastes great. My only complaint on the ribs was they were overcooked. The meat fell right off the bone. Despite that they were very good. The pulled pork had a nice smoky flavor to it. 10 Park Lanes serves BBQ right, because they keep the bark in with the rest of the meat to give you the full flavor of the pork. The one drawback was it was a little mushy, but the flavor was still great. 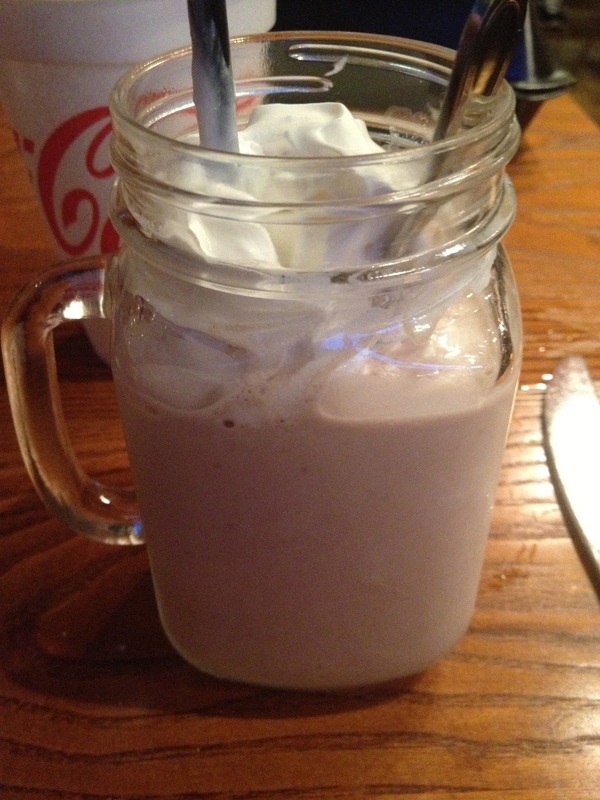 I ended supper with a half and half milkshake. It was half vanilla and half chocolate and all good. They also have four sauces they make; Jalapeño Coffee, Chipotle Apricot, Piedmont Blonde and Honey Comb. Each one brings a different element and flavor profile to the pork and draws out its flavor in different ways. The Jalapeño Coffee sauce is a tomato base that has a sweet, spicy flavor. The initial taste is the sweet with the spicy following. You can also taste hints of the coffee in it. The caramel coffee flavor rounds out the sauce at the end giving you a great tasting sauce. This would be awesome on ribs or wings. The Chipotle Apricot sauce has hints of the apricot sweet followed by mustard and the smoky chipotles with a hint of heat. The sweetness from the apricots really tones down the heat from the chipotle. This sauce works well on wings. Their third sauce is a Piedmont blonde. It is mustard based with vinegar and pepper. It is a more traditional South Carolina style sauce. It too has some sweet notes that counter balance the spice and twang. It is really good on the pulled pork. The final sauce is the Honey Comb sauce. This sauce is your more traditional style red BBQ sauce. It is a tomato based sauce that marries the sweetness of honey to a smoky flavor that is delicious. This is another good rib or wing sauce. 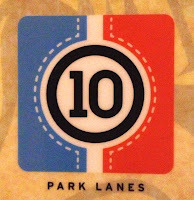 I like 10 Park Lanes. It is a fun place with good food. They make solid BBQ, great chips and yummy sauces. There are a couple negatives for the BBQ lover. There is no vinegar based sauced (Eastern Carolina style). The ribs were over cooked and the pulled pork was a little mushier then I like. I understand with cook times on BBQ it can be hard to keep it warm and not overcook it so I don’t hold it against them too much. The flavors were solid and you could taste the wonderful smoke in it. On the Gibbs Ribs scale* I give it a solid ¾ rack of ribs. It is pushing a full rack but not quite there. Would I go back? Yes. 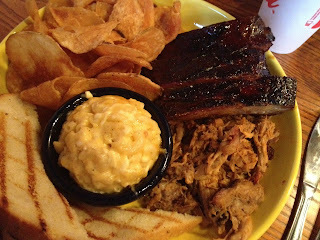 They are helping to bring good BBQ to the Queen City. *When I do reviews, books or otherwise, I rate the items with ribs (they are my favorite BBQ dish). A full rack is great and a single rib is poor. I will tend to stick to a full rack, half rack or one rib.